Stay up-to-date on the ethical and legal issues that affect your clinical and professional decisions! Ethical and Legal Issues for Mental Health Professionals: A Comprehensive Handbook of Principles and Standards details the ethical and legal issues that involve mental health professionals. Respected authorities with diverse backgrounds, expertise, and professional experience discuss contemporary theories emphasizing professional ethics, the ramifications of professional actions and decisions, and ethical standards on teaching, training, research, and publication. This informative handbook provides invaluable up-to-date information and guidelines vital for every mental health professional. This book is a thorough examination of ethical behavior which can be used as a reference source for the professional or a textbook for graduate students. The handbook itself is divided into five sections. The first section is a detailed introduction of ethics, law, and licensing. The second section presents general ethical principles like competence, integrity, and respect for individual rights and dignity. The third section examines confidentiality, privilege, consent, and protection. The fourth section focuses on general ethical standards in practice, including sexual contact, multiple relationships, and bartering. The fifth section presents the ethical principles and standards in teaching, training, and research. Appendices include the Ethical Principles of Psychologists and Code of Conduct (American Psychological Association, 2002) and the Code of Ethics of the National Association of Social Workers (National Association of Social Workers, 1999). This Handbook is an essential resource for all mental health professionals, including psychologists, psychiatrists, social workers, counselors, therapists, and graduate students in mental health and the related fields. 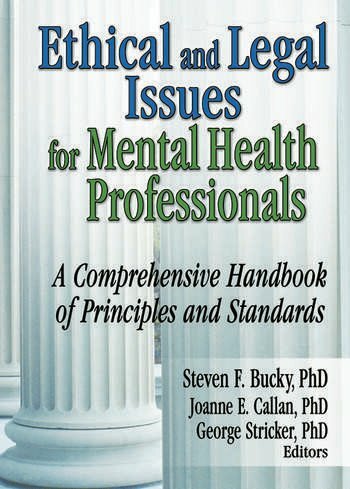 Ethical and Legal Issues for Mental Health Professionals: A Comprehensive Handbook of Principles and Standards is the first of three volumes under this title. The following volumes will focus on forensic settings and special populations/special treatment modalities.